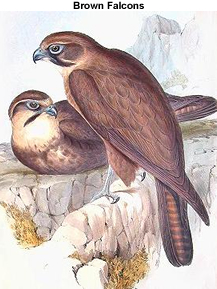 The Brown Falcons or Brown Hawks (Falco berigora) - also known as Cackling Hawks, Orange-speckled Hawks, Striped Brown Hawks, Striped Hawks, Western Hawks or White-breasted Hawks - have a wide range in Australia, where they are amongst the most common naturally occurring species of raptor. Their Latin name 'berigora' has been derived from their Aboriginal name. 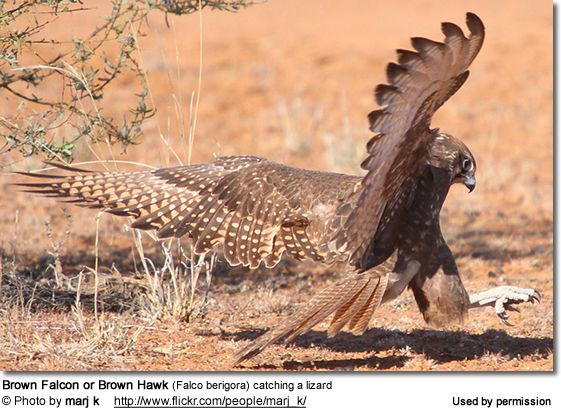 Brown Falcons are found throughout Australia (in all but the densest forests) ranging south to the island of Tasmania. Vagrants migrate north over the Torres Strait Islands to New Guinea and the Bismarck Archipelago (the Long Island). They mostly occur in open, unforested, grassy and agricultural areas, as well as in scrub and savanna with scattered trees or structures for perching. They come in dark and pale plumage forms - the pale-plumaged birds are usually associated with inland areas, while the others are scattered throughout the range. Some birds are resident, while others may move locally in response to environmental changes, such as moving from southern to northern Australia for the winter. Juveniles in particular are known for dispersing from the breeding areas. These birds of prey are usually seen alone or in pairs; however, when following locusts or other insects, up to 50 have been reported. Up to 8 subspecies have in the past been identified; however, according to recent studies, most of them are invalid and most likely a result of the confusion associated with the different color morphs. Range: Eastern, central, and northern Australia and Tasmania. Range: Central and eastern New Guinea and coastal northern Australia. Range: Southwestern and west-central Australia. 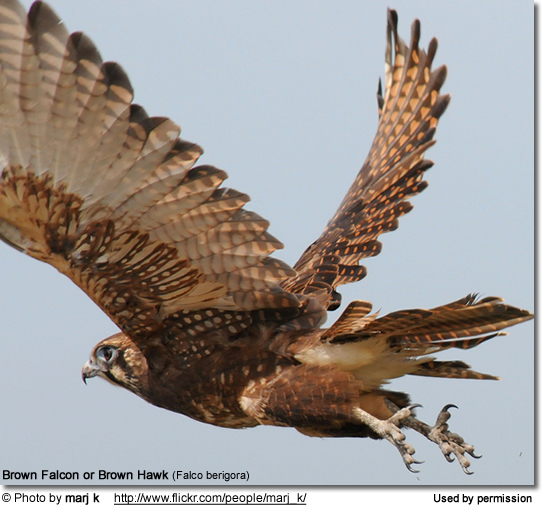 Brown Falcons are medium-sized raptors that measure about 18 - 20 inches (~ 45 - 50 cm) in length (including the tail). Females tend to be larger than males. These falcons have broader wings and longer legs than other falcon species. In flight, their slow moving wings are upswept. The tail is rounded. 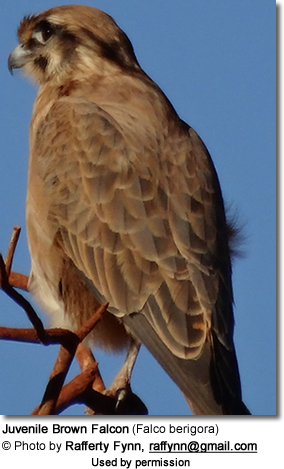 The plumage comes in different shades of brown with a paler underside. 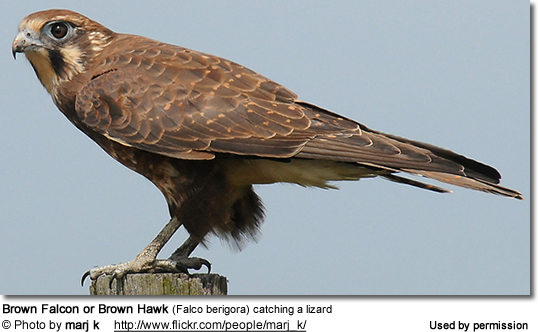 The upper plumage ranging from light / pale to very dark brown, and a variety of intermediate forms. The plumage below is usually pale buff or cream. Paler birds are usually found in central Australia and the darker forms occur in the tropical north. The head is usually red-brown with narrow black "tear-stripes" below the eyes. The crown is light-colored and the chin off-white. The wings are a spotted red-brown with dark brown quills. The eyes are brown with some blue around the margin. The beak is light-blue to grey tipped with black. The legs and feet are bluish. Juveniles resemble dark-plumaged adults, but have a buff-yellow-colored face, throat and nape (nape (back of the neck)) and the barring on the tail is less obvious. 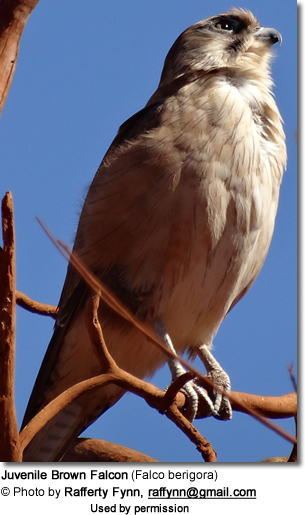 Paler birds may often be confused with the Nankeen Kestrels - however, the latter is smaller and has a more reddish-brown crown. Dark brown forms may be mistaken for the slightly larger Black Falcons, however, Black Falcons are sleeker in shape, have longer legs and lack the barring on the tail. 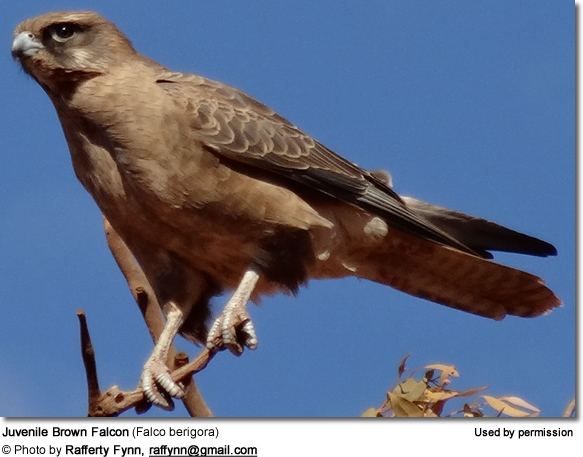 Brown Falcons mostly feed on small birds (including farm chicken), often taken from the ground; as well taking small rodents, lizards and snakes. They will also take small mammals (mice, rats, up to the size of young rabbits), reptiles, fish, large insects, such as caterpillars, grasshoppers, crickets and beetles, and carrion (road kill, etc.). They are usually on concealed perches until they spot and drop down on their prey. They may also hover or glide as they hunt for prey animals. Insects are usually captured on the ground or they follow swarms of locust and catch and eat them on the wing (in flight). Chicks are often taken from their nests. They also follow farm animals and grassfires to capture flushed prey. They may also steal prey from other birds of prey. Nestlings are fed pieces of meat and as the young grow older are provided with larger pieces of prey which they have to tear apart themselves. Brown Falcons usually only breed once a year - however, they may not breed at all during drought times or produce a second clutch when conditions are optimal. Most nesting is observed between June to November in the south and April to June in the northern part of their range. These solitary nesters often use abandoned large stick nests of other bird species (usually other raptors or corvids) that are situated in upright forks of the tall trees, or occasionally in hollow tree cavities or artificial structures. Their nests are usually situated about 13.12 - 98.5 feet (4 - 30 meters) above the ground, and found in trees situated along watercourses. Nests are often reused for several years. The average clutch consists of 2 - 3 eggs (sometimes as many as 5). The eggs are covered in red and brown spots and blotches and are oval-shaped, measuring about 1.3 - 2 inches (33 - 51 mm). The eggs are incubated for about 33 days and the young fledge (leave the nest) 36 - 42 days later. Both parents share the brooding of the eggs and raise the young; although the female performs most of the tasks, while the male hunts and brings food to the nest for the female and the nestlings. Their calls are described as raucous crowing, cackles, chatters and screeches; or as loud cackle vocalizations that are uttered frequently.